Difference between revisions of "Kontact"
Kontact suite unites mature and proven KDE PIM applications under one roof. Thanks to the powerful KPart technology, existing applications are seamlessly integrated into one. The components of KDE Kontact are tailored to work well with each other. This results in features like intuitive drag-and-drop between appointment handling, task lists and contacts. KDE Kontact supports various groupware servers. 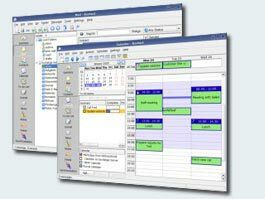 When using these servers your workgroup has access to features like shared email folders, group task lists, calendar sharing, central addressbooks and meeting scheduling. In short: KDE Kontact delivers innovations to help you manage your communications more easily, organize your work faster and work together more closely, resulting in more productivity and efficiency in digital collaboration. kdepim-users - for users of the KDE PIM applications (Kontact, KAddressBook, KMail, KOrganizer, KNode, ...) [subscribe to kdepim-users] [archive of kdepim-users]. A team of developers and user aim to give answers as quickly as possible. In Kmail, right click on your Inbox and choose Properties. Go the Maintenance Tab. Have a look at the Location. It has either .kde4 or .kde in the path. Substitute the appropriate path below. and the whole .kde4/share/apps/akregator directory. Just a word of warning. If the directory naming is different between Desktops or between the two versions of Fedora, this will not work as there are references to the directories within the config files. This means that if the files were in a .kde directory, you cannot just put them in a .kde4 directory without editing the references within the config files. Drag the left panel closed using the splitter between it and the main panel, job done.